This had been a particularly emotional day. Many changes taking place in my life and those I hold dearest. I was standing at my kitchen window and observing everything that was going on outside, all the while trying to process the range of emotions. Our little area of the country had desperately been crying out for rain, and the heavens had answered. The temperatures had dropped, and the mist of rain made the atmosphere grey. The squirrels were scurrying frantically along the fence row doing what squirrels do, totally oblivious to the weatherman’s threat of thunderstorms. The entire scene looked like a fresh watercolor painting – paint brushes still wet with creativity. The winds had escalated. The trees seemed to be in a tug of war, and they were losing. Their limbs were waving in the winds responding to the force that was assailed against them. 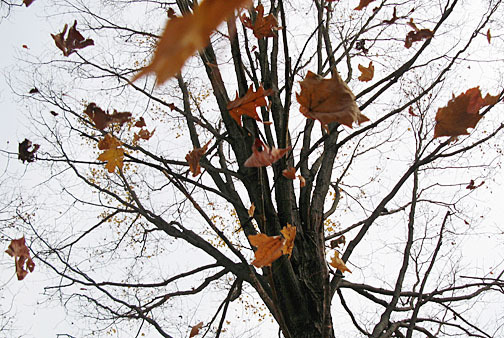 By now, the leaves had lost much of their strength being evidenced by their color or lack there of. Although, each leaf was in a different state of transition, they seemed to dance with grace as they fell to the rain soaked ground. I became fascinated with the process. These mighty oaks were forced to relinquish complete control over their destiny. I watched in amazement as these pillars of strength bowed to the providence of God. One by one they released their covering and succumbed to being stripped bare – totally exposed to the elements. It was then the Lord began to speak these words of truth to my heart and teach me a life lesson from my own backyard. He said, “The favorite part of a tree’s life is when it is lush with life and fulfilling its’ purpose and providing shade/shelter or even fruit. The harsh elements are being used to force My creation, (the tree) into its’ next season, perhaps, not one of its’ own choosing, but in accordance with My divine plan.” GASP! Selah…think of that. It was a fresh revelation for me to realize that everything has an expiration date whether it be visible or not…not just leaves, but our very lives. It is our frail humanness, selfishness, regret, and ultimately lack of trust in God that makes us want to hang onto our loved ones long beyond their expiration date. 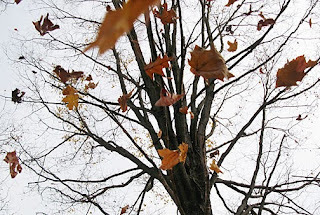 As the leaves piled higher and higher I no longer viewed them as a nuisance to be swept or raked, but a gentle reminder…that obedience is better than sacrifice. Slowly….reluctantly…. trustingly…..I am releasing my grip. In due season, the wise old trees will bud again with renewed hope…and life.